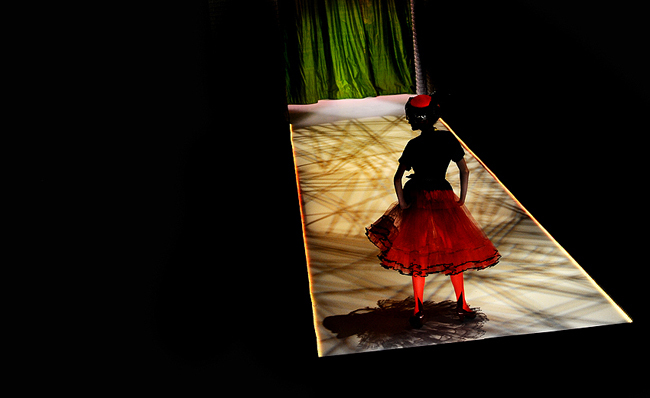 "Perfecting the walk on the runway, a model showcases an outfit during Center Stage's recession-inspired, annual fashion show, May 1, 2009." Photographed a weekly fashion piece (portraits of fashionable people) before a fashion show and decided to stick around to actually see it. The reporter had two free tickets because: A. I assume she knew the people who ran it; B. She did her piece there. With that, she convinced me to stick around. Since I had some time to burn, I did. I have never been, nor seen, a fashion show and thought it was pretty interesting. Not only are the wardrobes far out there in my t-shirt and jeans eyes, but the continual bass from the techno beats put a smile on my face. Oddly enough, I didn't shoot much during this. Not sure why, maybe I was more intrigued by the style of the models or laughing at some of the crazy stuff people had on. Whatever the reason, I snapped the equivalent of one roll of film and liked this frame.